Thank you for your kind attention and for caring about your people. In such a difficult time for the Ukrainian people it’s hard to keep the faith. I believe in Ukraine, in my people, and want to believe in you as our Guarantor. I will get though this! I ask you sincerely to please help Ukraine. I want to believe that you will accomplish everything better than your predecessors did, and our country will finally achieve peace and harmony. For that, you have every opportunity, and I believe that the desire and the wisdom is there too. Nothing is forgotten, no one is forgotten! I believe in Maidan, and in my people! And in [our] victory! This entry was posted in "Voices" in English, #Free Savchenko, English, English News, Pictures, South&Eastern Ukraine and tagged #Amnesty_International, #Nadiya Savchenko, #RussiaInvadesUkraine, #SaveOurGirl, #SaveUkraine, #ukraineprotests, Human Rights, President Poroshenko, Russia, Ukraine. Bookmark the permalink. You have to make some new kind of medal for Savchenko. She did not ask anything for herself. A true patriot. She is a true Ukrainian hero. May God protect her! In every generation, there is born a person of such character, courage, bravery, and honor, that they cannot be suppressed. Indeed, the very forces that seek to push them back down, to defeat this indomitable spirit, succeed only in bringing out the very best in them. And another generation is inspired to reach a little further, to stand against the wind yet a little longer, to hold a candle in the window a little longer, to secure steady footing- not to catch one’s breath, but in order to extend a hand to those still on broken ground, and bring them home. Ukraine’s Hope is truly an inspiration for us all. I hope someone will translate back into Ukrainian for us, and tell her. Like Mamchur in Crimea, her oath is her life. .. ми витягнемо тебе , Надіє !!.. вір , своїх не кидаємо !!.. тримайся !!.. Слава Україні !!.. 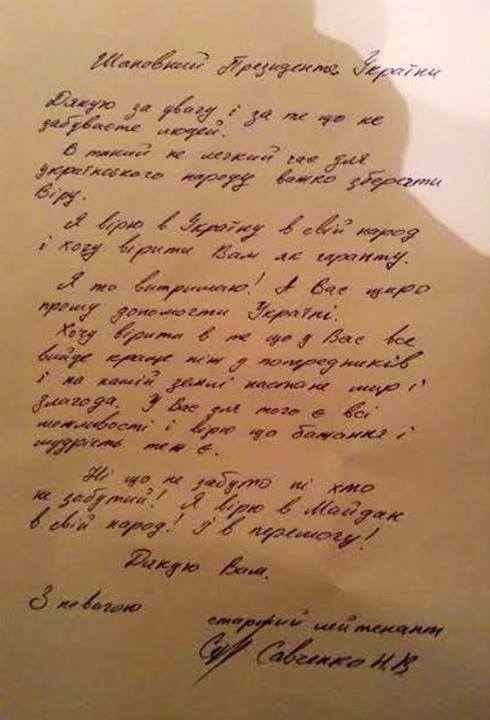 Героям Слава у віках !!.. God Bless Her. She is truly what represents all good that humanity has.